This summer, Jerusalem Peacebuilders Youth Leadership Program brings Jewish, Christian and Muslim teenagers from across the Middle East to 4 sites in the US. They learn about each other — and themselves — in the hopes of creating a better future across religions, cultures and nationalities. New Haven is one of those 4 hosts. This week, participants worked together on a large mural depicting young refugees washing ashore. Called “We Welcome Refugees,” it will hang near Exit 42 of I-95 in West Haven. 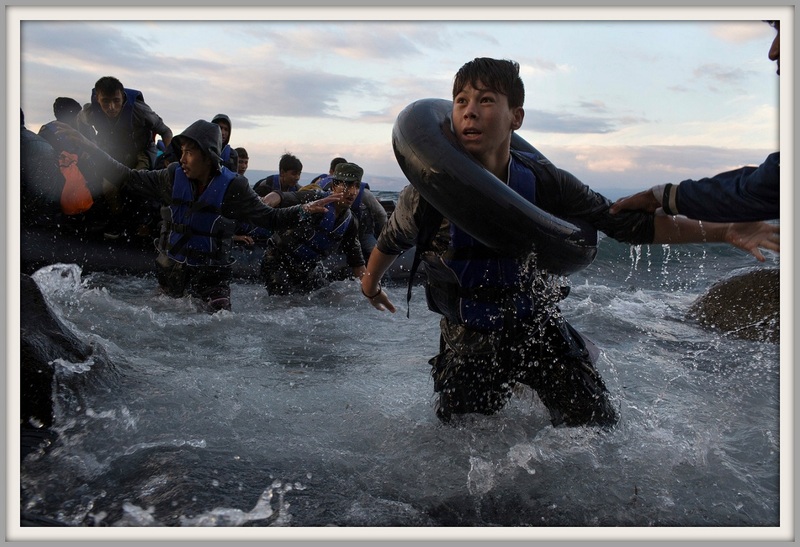 According to the New Haven Independent, the mural was inspired by a photo of a young Turkish boy arriving in Greece in 2015. Artist Russell Rainbolt — who is working with the Jerusalem Peacebuilders teens — generalized the image to represent all refugees, everywhere. That fits well with the program’s theme of a common humanity. Nice. But why is this story “06880”-worthy? The photo that the Rainbolt and the teenagers are working from was taken by New York Times photographer Tyler Hicks. And — as proud Westporters know — that Pulitzer Prize winner is a 1988 graduate of Staples High School. For the past couple of decades, he’s wandered — and photographed — the world. These days, he lives in Kenya. But an impressive interpretation of his work will soon hang a few miles from here. “06880” is indeed where Westport — and West Haven — meet the world. Practice what you preach, Westport. Maybe go back and write essays about white privilege, since you didn’t get it the first time.